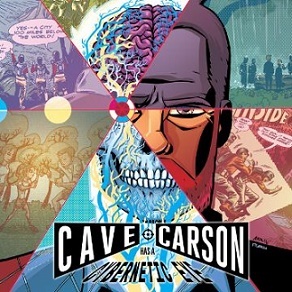 Cave Carson has a Cybernetic Eye #1 is written by Gerard Way (Umbrella Academy), who is also known from his other career a the vocalist of My Chemical Romance, and Jon Rivera (Heartbreak). This quirky tale tells the story of eponymous hero Cave Carson, a silver age creation who receives a well deserve and definately long overdue reboot. The new DC Comics project brings illustrator Michael Avon Oeming (The Mice Templar), into the collaboration. Adventurer, Carson Cave is pulled back into the past when events at his secret underground lab plunge him into a new predicament. Cave has saved the day in numerous hazardous missions beneath the Earth’s surface, one of which resulted in the implant of his cybernetic eye. Cave’s plans to return once and for all to the planet surface to live out his days are well and truly on hold. His only option is to embark on resolving a new mystery. Cave Carson was created in the early 1960s, by France Herron and Bruno Premiani, one of many iconic figures to debut in the Brave and the Bold series. This latest series is published under DC’s new line Young Animal. Cave Carson has a Cybernetic Eye #1 will be available from October, 19th.